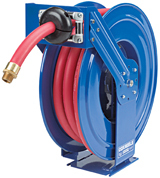 New models as part of Coxreels’ T-Series truck-mount reels feature increased capacities of 75 feet for 0.75-inch-internal-diameter hose and 50 feet for 1-inch hose. A new dual-bearing axle support system creates smooth low friction, extraction and retraction for the resistance of wear in abusive environments. All reels in the heavy-duty T-Series are spring-motor-operated and, for strength and rigidity, come standard with Coxreels’ Super-Hub and triple axle support with full frame. All models handling 0.75- to 1-inch hose will now be equipped with stainless-steel rollers to further increase durability in extreme applications.